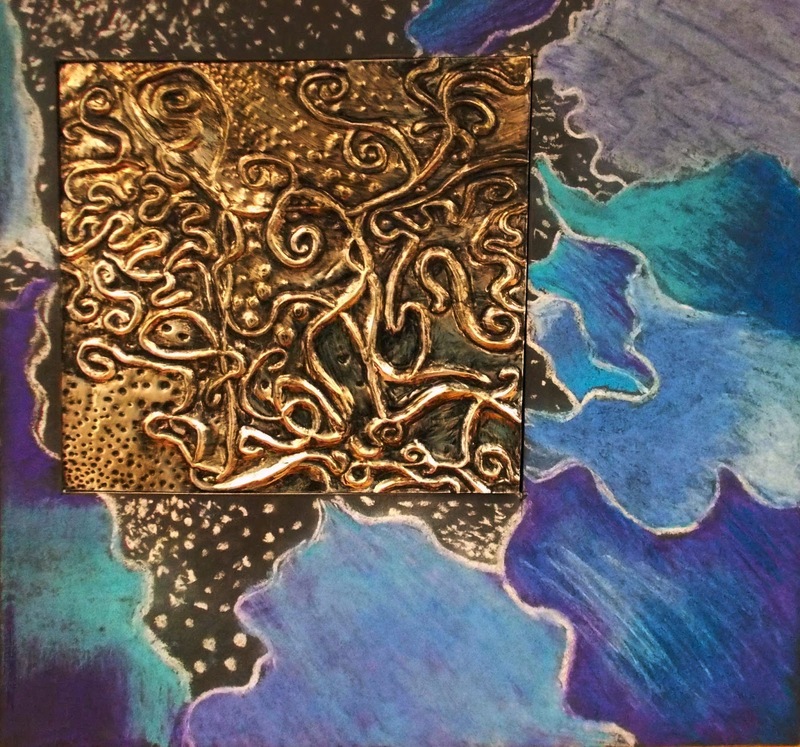 Ilinois High School Regional Art Exhibition! 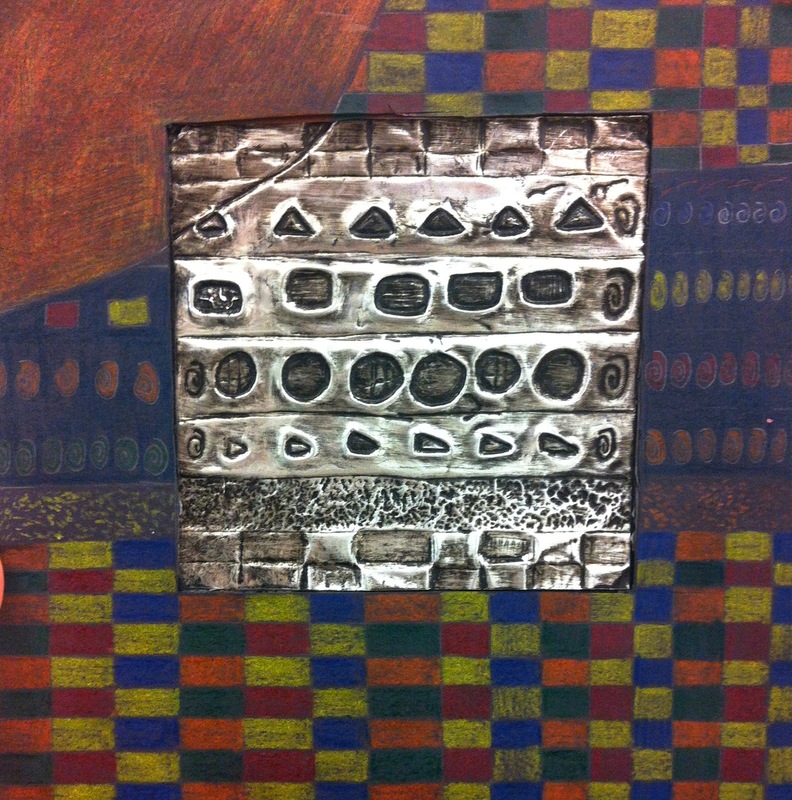 Credit: Found these awesome embossed artworks on PINTEREST and had to give 'em a try in my Mixed Media 1 & 2 Class. 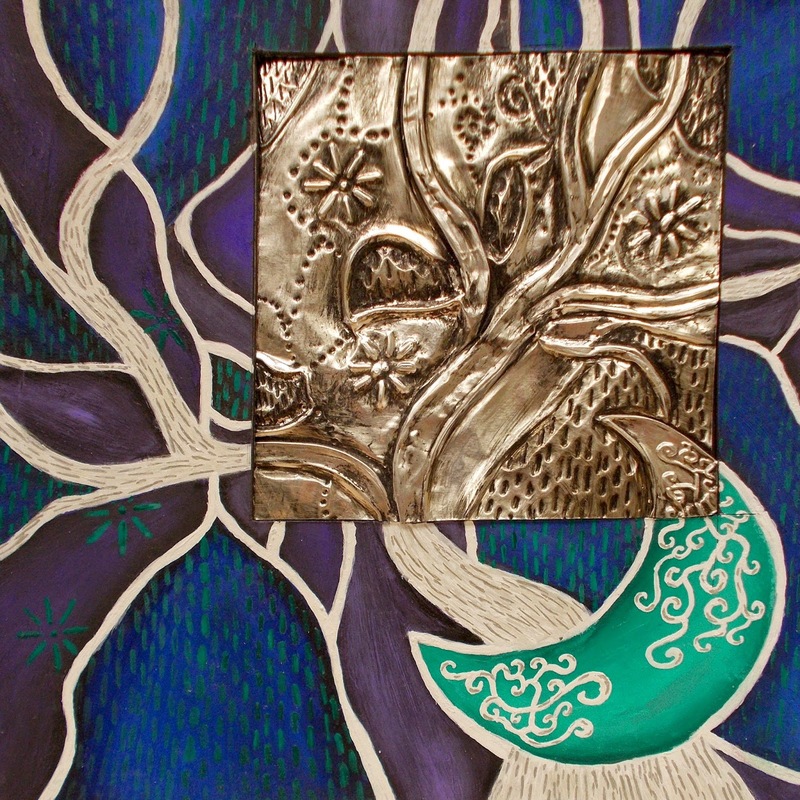 Summary: Students review the Elements of Design (that was learned the previous year in art), and apply all seven Elements within the artwork while exploring the medium of embossing. 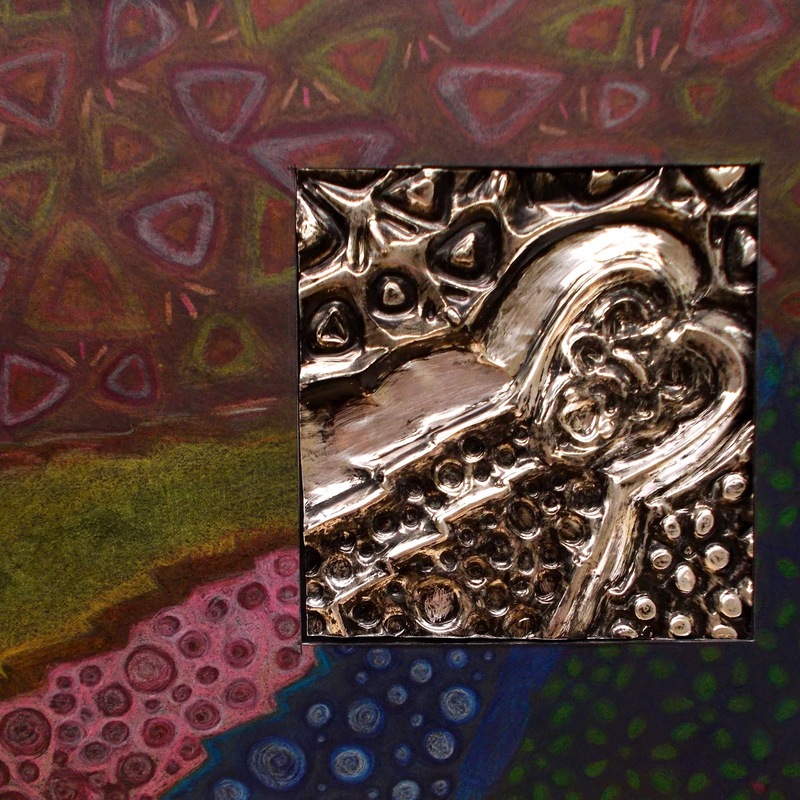 Engage with History of Embossing PPT which includes examples, vocabulary, tools, techniques, and other types of materials that can be embossed as well as historical reference. Students take notes and "doodle" in their sketchbooks. Elements of Design are reviewed. 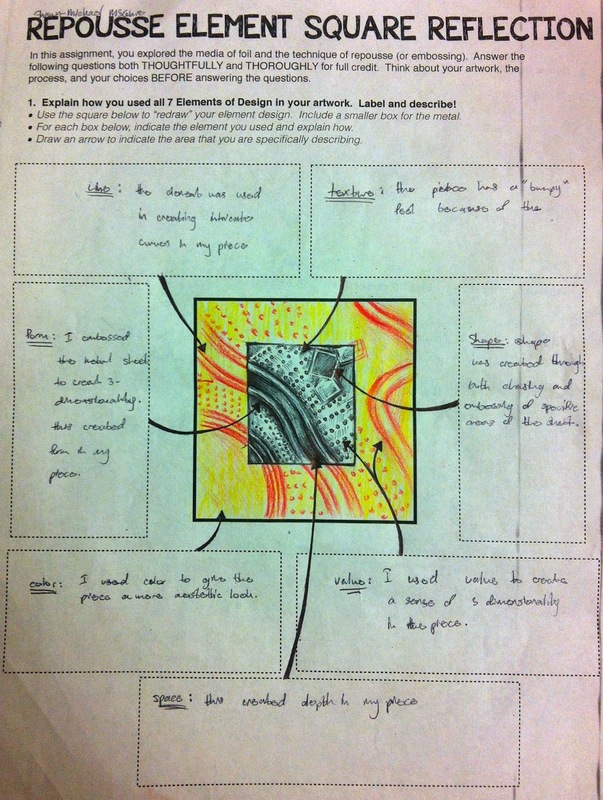 Students explore examples of each in their sketchbooks. 2 "Handprint" sketches (we joke about the thumbnail sketch and how this particular sketch needs to be larger and more "accurate," but still not a finished artwork). 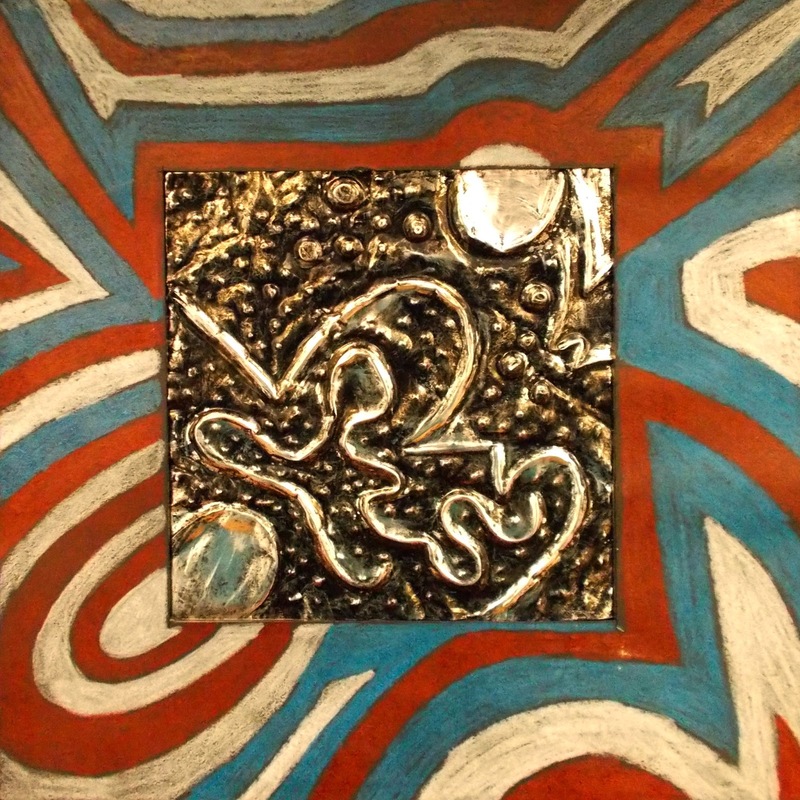 These sketches play with abstract design and the use of design in artwork (as opposed to representational). 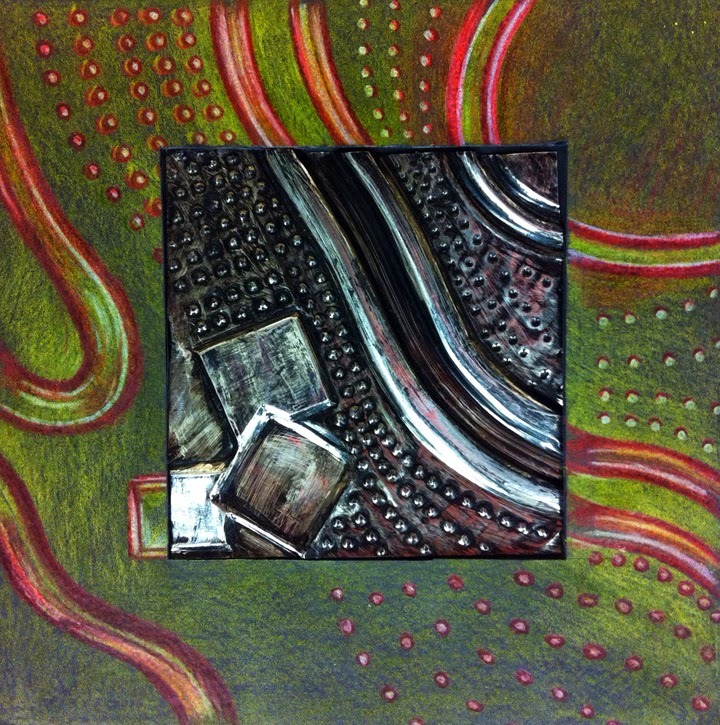 Students lay their metal square under their sketchbook page and "trace" their design onto the metal using wooden tools. The sketchbook pages act like a cushion, allowing the metal to be chased. 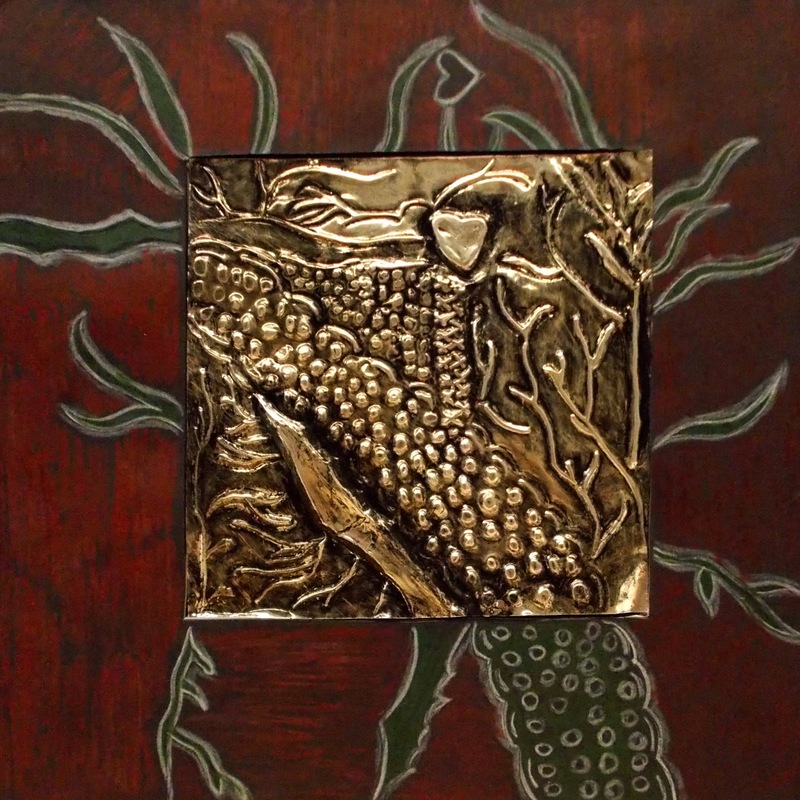 Students then work their design by embossing and chasing, playing with the relief aspect of the metal. Once fully developed, the metal is laid on top of the larger mat and traced. 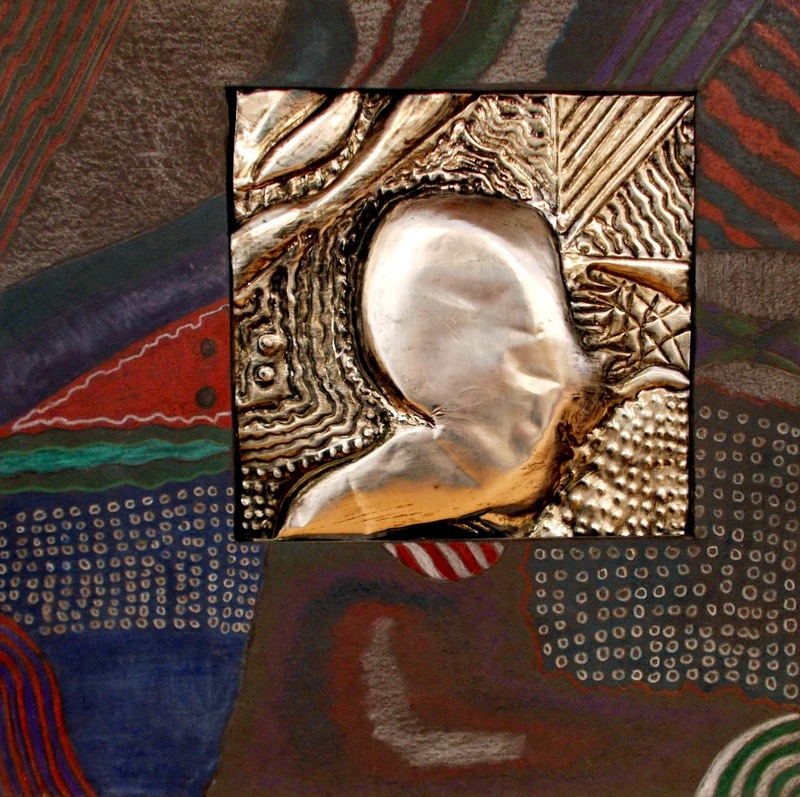 The embossed design is then "extended" in a drawing onto the mat. Students practice using a color scheme in their sketchbooks on their sketches. Once a decision is made, students translate that color scheme onto the mat and develop values and contrast using color pencils. 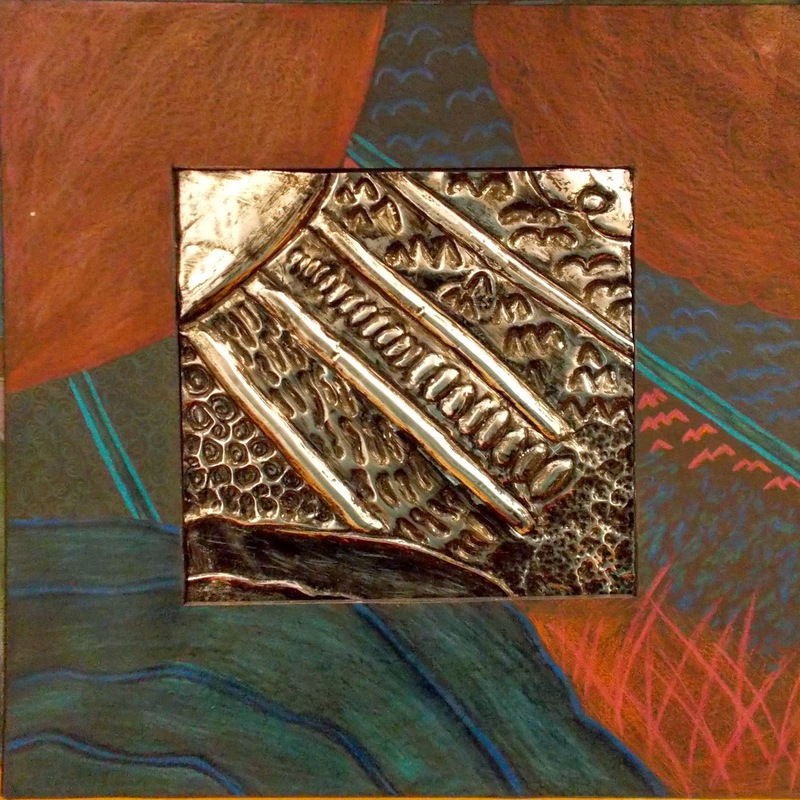 A window is cut into the mat, and the students mount their metal repousse from behind. 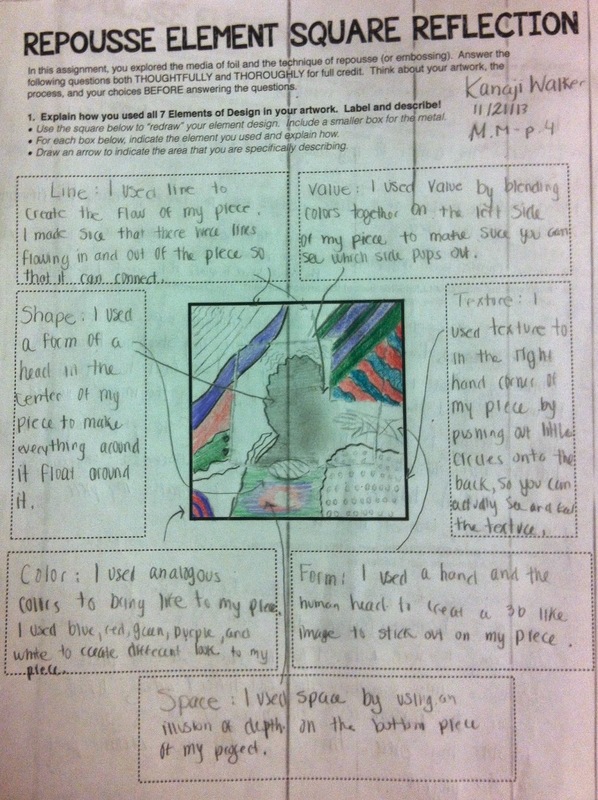 Students complete a reflection in which they have to redraw their completed square and clearly label each element used in their artwork. On the back, they answer a variety of thought provoking questions as well as recall the steps to creating their artwork. Don't forget the class critique! 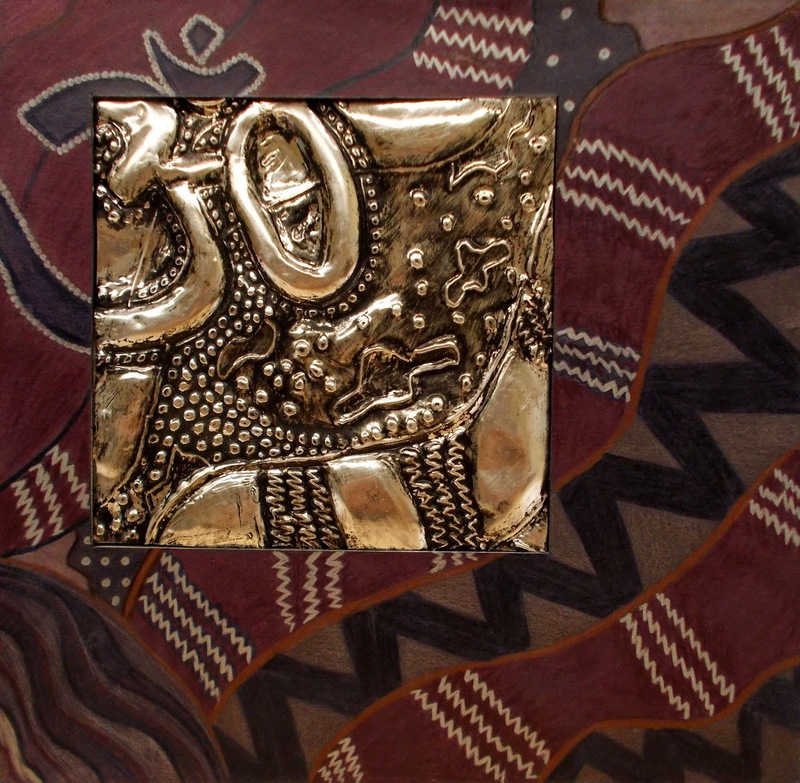 This mat was created using chalk pastels. Chicago Public School All-City Art Exhibition. The mat is painted with acrylic paint. Thanks! Thrilled with these students' works! 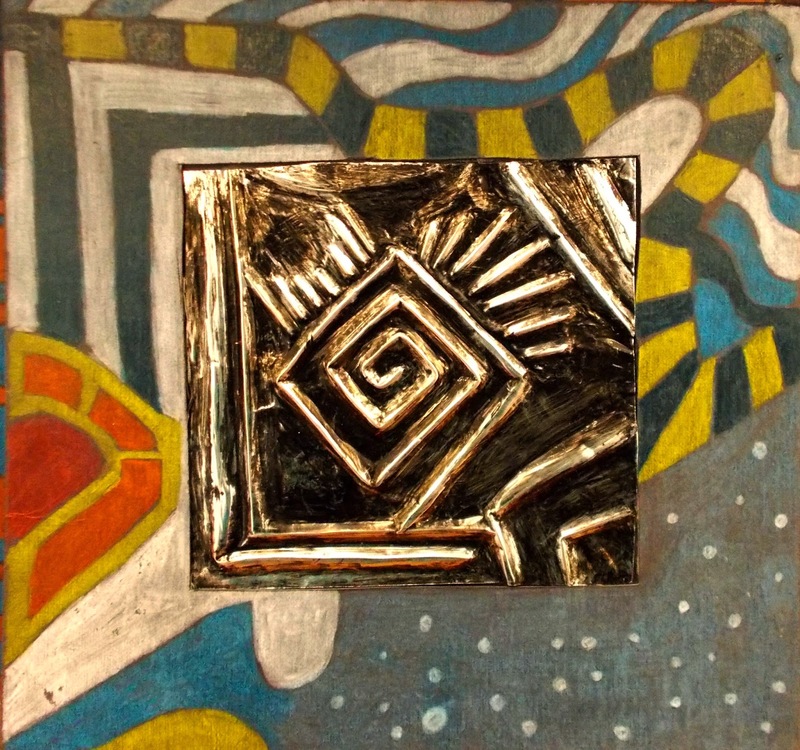 Hi Janet, What are you using to for the black effect on the repousse tiles? 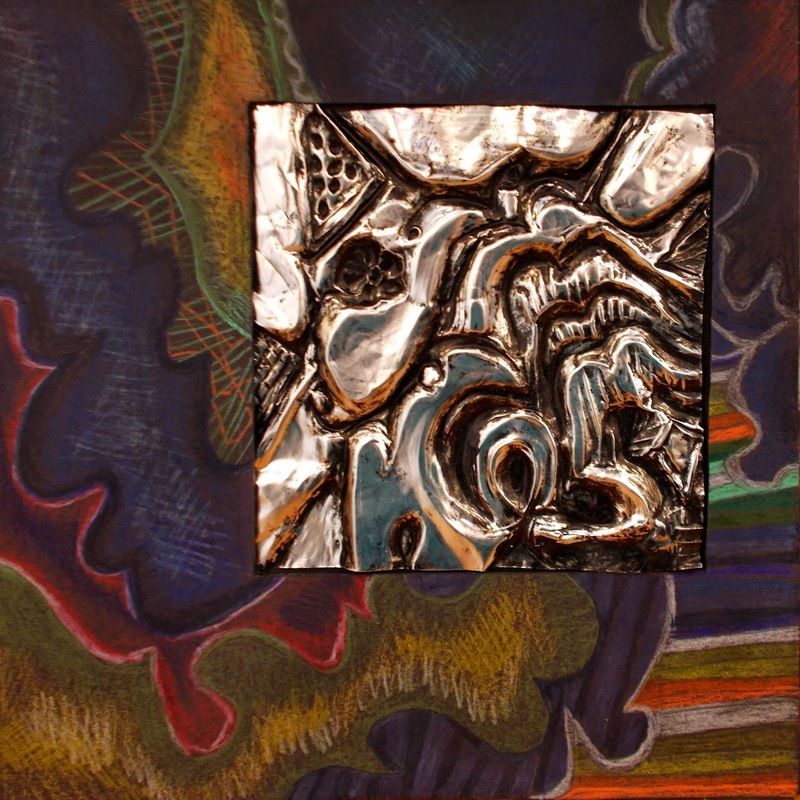 I'm presently doing this technique with my grade 10-11 art class using aluminum sheets. I love the value and contrast on the pictures you posted. Black tempera paint works fine. Just let it dry and buffer it away with some paper towels! As SEB said, you can use black tempra. I used India Ink. I'd say for both, however, that you do need to make sure the the metal has been "degreased" from the metal oils and finger oils. The ink and paint resist a bit the first time. If they weren't degreased well enough, I just had the students let the ink dry a little, then add another coat, and rub/buff with paper towels or soft fabric. Any chance that I could get a copy of your Repousse PowerPoint and your worksheet? MrsCrouchLovesArt (at) gmail (dot) com. I too was wondering about the PowerPoint. Is it on TPT by chance? I do a very similar project and I was looking to improve my introduction to it. Thank you! Did you ever post a link to a site to purchade or give access to your lesson information? I would love to try this with my students! Would you be willing to share your powerpoint with me and a copy of your reflection page? I would love to try this lesson. Your student work looks awesome...a sign of a fabulous teacher! These are amazing! Great project. Thank you for sharing. I love this lesson and would very much appreciate access too the powerpoint. Is it available for share or for sale? Please let me know. lkeesler@pasco.k12.fl.us Thank you!